As a graduate candidate in public management and leadership, Caroline Covell has been a freelance consultant, project officer, policy/political analyst, assistant adviser to the minister, economist, researcher. 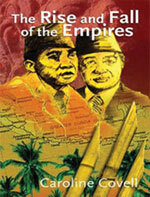 The Rise and Fall of the Empires (2004) examines the Indonesian regimes of Sukarno and Suharto. BIBLIOGRAPHY: The Rise and Fall of the Empires (Salt Lake City, Utah: American Book Publishing, 2004).